Music, passion, madness, and one woman's fight for her right to a career. The intense relationships between Robert Schumann, his wife Clara Schumann and the young Johannes Brahms come to theatrical life in a new romantic drama by playwright and renowned concert pianist, Israela Margalit. The U.S. premiere of Trio, directed by Rick Sparks and featuring Peter Colburn, Bjorn Johnson, Meghan Maureen McDonough, Brian Normoyle and Jeremy Shranko, opens for a five-week run on March 12 at the Lounge 2 Theatre in Hollywood. Robert Schumann, Clara Schumann, and Johannes Brahms: three musical giants who loved, admired, and nearly destroyed one another in a clash of personal and artistic passions. The story of the sometimes troubled marriage of Clara and Robert, the arrival in their household of the dynamic, 21-year-old Brahms, Robert's decline into mental illness, and the deepening, intriguing bond between Clara and Brahms, has fascinated music lovers for years. "It's a classic romantic triangle, set in a hotbed of artistic fervor," notes Sparks. Although inspired by history, Trio is a work of dramatic fiction. Margalit was already deeply familiar with the characters and their story before she began writing, having previously penned a television special about Clara Schumann for ZDF Germany, and having performed the music of Schumann and Brahms extensively in concerts and recordings. "I did an enormous amount of research, including traveling to Germany to read all available historic documents in the original language," she says. "The relationships between the three of them - between Robert and Clara, Robert and Brahms, and Brahms and Clara - were very complex. These were three larger-than-life personalities with huge artistic egos." "Clara Schumann was the most famous female concert pianist in Europe when she curtailed her career to marry Robert Schumann and give birth to eight children. He was a huge talent, but he was plagued by problems: he had ruined his hand and couldn't play the piano; his music was not popular; he lacked the personal charisma to succeed as a conductor; and he suffered from depression. Johannes Brahms was young, charming, and idolized them both. But no one knows for certain what really went on between them. It's a matter of reading between the lines and using one's imagination. The characters and events in the play are all historical, but the interpretation is mine." Trio was first discovered by Russian theater director Pyotor Stein, who directed Emmanuil Vitorgan, Yevgeniya Kryukova and Dmitry Isayev, three of Russia's most famous actors, in the world premiere, in a Russian translation, at Moscow's Soveremenick Theater. Moscow-based music critic George Loomis noted in a story for the International Herald Tribune that Trio was "a rare instance of a new American play receiving a commercial production in Russia." It became an instant hit, performing to sold-out halls for five years in Moscow, St. Petersburg, Kiev, and throughout Russia and Ukraine. Now in its second Russian production (with the original cast), it continues to perform as a guest production at Moscow's Vachtanghov Theater. The Russian Cultural Report wrote, "We thank Israela Margalit and Pyotor Stein for lighting our souls...for this production full of humor, light, taste, humanity, and wonderful music." Music is integral to the play, functioning almost as an additional character. All of the piano excerpts used in the production have been recorded by Margalit; her son, Ilann Margalit Maazel, joins her on the recording of Brahms' Hungarian Dance for 4 Hands. Israela Margalit is an award-winning playwright and television writer, concert pianist, and recording artist. In addition to Trio, her plays include Night Blooming Jasmine (directed by Jeremy Dobrish, The Tribeca Playhouse); 3 O'clock in Brooklyn (directed by Margarett Perry, Access theater); and First Prize, which is set to premiere at the Arclight Theater in New York, directed by Margarett Perry. Her short play, On the Bench, received an honorary mention for Outstanding Play at the New York 15-Minute Play Festival. Her television specials for ZDF, Transtel/Deutsche-Welle/PBS, and Arts & Entertainment, including a series with Sir Peter Ustinov, have been shown in more than thirty countries, and received The Gold Medal of The New York Film and TV Festival, two NEA Media Awards and an Emmy nomination. Israela has recorded extensively for EMI, Universal Classics and Jazz (UCJ), Chandos, Black Box, Resonance, Koch International and Decca. Her most celebrated recordings include the 20th Century Anglo/American Chamber Music Series (British Music Industry Award - Best CD, Korngold) the Brahms First and Rachmaninoff Second Piano Concertos with the London Symphony Orchestra, the Saint-Saens Second Piano Concerto and the Schumann Piano Concerto with The London Philharmonic Orchestra, and the Shostakovich First and Schnittke Second Piano Concertos with The Moscow Philharmonic Orchestra. She has appeared with fifty of the world's greatest orchestras, including The Berlin Philharmonic and The American Big Five, and toured in the US, South America, Western and Eastern Europe, the Middle East, and Asia. Rick Sparks recently directed the currently running, critically acclaimed production of Daddy at the Hudson Mainstage. He co-adapted and helmed (in association with CBS) I Love Lucy Live On Stage for Las Vegas. Other directing credits include Divorce! The Musical; the critically acclaimed L.A. premiere of Psycho Beach Party by Charles Busch; his own multiple award-winning adaptation and staging of They Shoot Horses, Don't They? ; a rock 'n roll adaptation of A Clockwork Orange (his second LA Drama Critic's Circle win for Direction); Down South, which moved to New York after a long L.A. run; The Nothing Boys (produced by TV's 'Entourage' producer Rob Weiss); Laguna Playhouse's West Coast premiere of Don't Talk to the Actors; The Colony Theater's critically acclaimed production of Clutter; and John Patrick Shanley's West Coast premiere of Where's My Money? Set design for Trio is by Joel Daavid; lighting design is by Jeremy Pivnick; costume design is by Sharell Martin; sound design is by Robert Arturo Ramirez; and the production stage manager is Justine Baldwin. Racquel Lehrman, Theatre Planners produces. 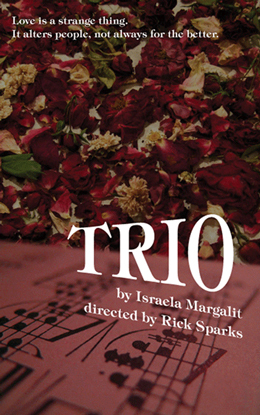 Trio opens on March 12 and continues through April 10. Performances take place Fridays and Saturdays @ 8 pm, and Sundays @ 7 pm. There will be three preview performances on Saturday, March 5 @ 8 pm; Sunday, March 6 @ 7 pm; and Friday, March 11 @ 8 pm.Tickets are $25; students and seniors pay half-price (use promo code 001); previews are $15. The Lounge 2 Theatre is located at 6201 Santa Monica Blvd, Hollywood CA 90038.